Airlife, 1993, Hardback in Dust Wrapper. Condition: Very Good+ - in Very Good+ DJ. Faint creases to the top of the upper panel near the spine. Book shop sticker to the first blank. Text complete, clean and tight. From the cover: “John Worsley was one of the very few active service artists of the Second World War, and in this book he recalls his experiences both in active sea warfare and later as a prisoner of war. 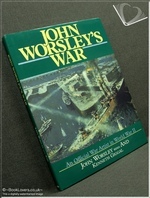 At the outbreak of war the twenty-year-old John Worsley joined up as a Midshipman and during off duty moments sketched his fellow sailors and incidental scenes of life at sea. Having survived the sinking of his first ship, HMS Laurentic, destroyer service on Atlantic convoys and, during 1942, troop convoys from the Red Sea to Australia in the cruiser HMS Devonshire, in 1943 he was made an Official Naval War Artist on the Commander-in-Chiefs staff, Malta. After covering the first Italian landing in the Straits of Messina at Reggio and later the landing at Salerno, he moved on to cover some of the nefarious activities opening up the Naval front in the Adriatic and there was captured by the Germans. As a prisoner he continued depicting the PoW life around him and helped to produce forged identity papers and, most ingenious of all, he created ‘Albert’, the successful dummy Naval Officer escape device used both for the initial escape of one prisoner, and also as his stand-in on three roll calls a day for four days after. The celebrated film Albert RN is based on this episode. Size: 10½" x 8". Turquoise boards with Gilt titling to the Spine. 116 pages.